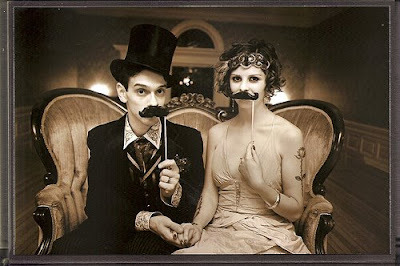 See more of this super cool, vintage-inspired, magician-marries-his-lovely-assistant wedding here. What an amazing wedding! The kids have style! this makes me want to get married! or maybe not, since i certainly can't compete. because i don't have a fake mustache! or even a real one! just a lone chin hair. I looked all over for fake mustaches like this for my photo booth. I would not have pulled it off as well as they did even if I had them though. oo! i like that! i wish i had one of those mustache things just lying around here - i'd wear it all the time - even to the corner deli. Fake mustaches + wedding = awesome. Fabulous mousers. Makes me quite sad that I can't grow my very own. wow. magical. i am jealous.